On Dec. 10, Mrs. Ferrell's eighth-grade science students worked alongside an engineering team from Practical Energy Solutions (PES) to conduct a school-wide energy audit. Independence was recently selected to participate in the fifth year of the Delaware Pathways to Green Schools Program, and the energy assessment served as one of the first steps in the year-long project. The audit helps to involve Indy's students on every level of our efforts to become more energy and environmentally responsible and efficient. The Pathways program, created by the Delaware Sustainable Energy Utility and Green Building United, provides grants, one-on-one support and expert resources to K-12 schools in Delaware that are committed to reducing energy use and fostering the growth of sustainability initiatives. 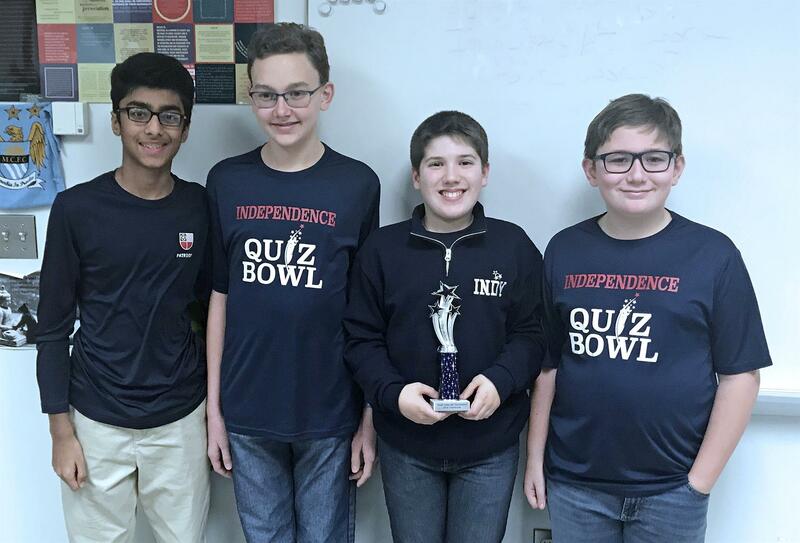 Independence's Quiz Bowl 'A' Team - eighth graders Ben Jordan, Jacob Poplawski and Gautam Wadhwa and seventh grader Nico Abbott - placed first at the 22-team Great Valley Middle School Tournament in Malvern, Pa., on Dec. 8. The 9-0 performance by Indy 'A' qualified a team from our school for the Middle School National Championship Tournament (MSNCT) this spring in Rosemont, Ill. Individually, Nico placed second among seventh graders, and Jacob earned fifth for eighth grade. The Independence 'B' Team - seventh graders Olivia Jordan, Rai Kahlon, Tess Wolf and Louie Zhang - finished with a 5-3 record. The Quiz Bowlers return to competition on Jan. 26 at Manheim Township High School in Lancaster, Pa. The second of our annual Holiday Concerts will take place tomorrow, Wednesday, Dec. 12, with performances by our Band & Orchestra. The show starts at 7 p.m. in the Gore Auditorium. For a photo gallery of our Choral concert on Dec. 6, please click here. Independence experienced tremendous success at the Tatnall Scholastic Chess Challenge on Dec. 1, capturing two team championships and one individual. Sean Allen, Benjamin Garrett, Bradley Hu, Aashritha Koya and Aditya Rustagi joined Parth Rustagi (Indy Class of 2018) to earn first place in the 4-9 Unrated section. Additionally, Aditya placed second individually. Kabir Goyal, Colin Kipp, Sam Perny and Johnny Wyant won the U 900 team championship, with Kabir taking first individually. Asher Eichenbaum, Ben Eichenbaum, Raphael Lombardi, Colin Schneider and Carter Wilke also competed at the event. 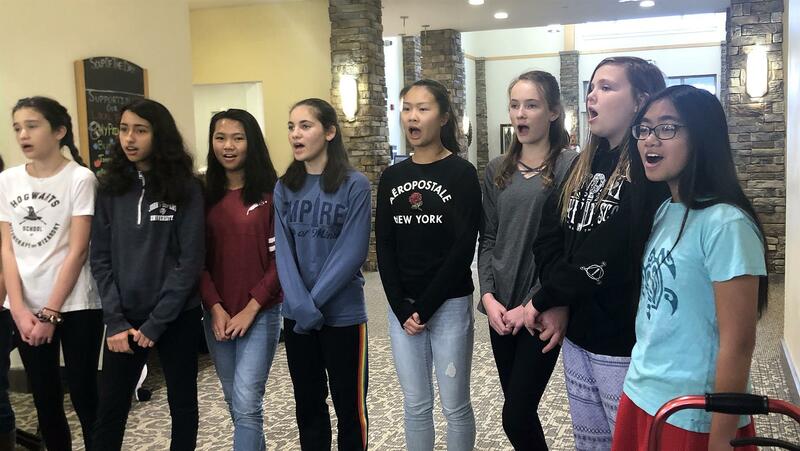 Members of our seventh- and eighth-grade Chamber Choir, under the direction of Tae Sakamoto, sang to Pre-K classes at The Goddard School in Lantana Square on Nov. 13 and performed holiday songs at The Summit, a senior living facility, on Dec. 7. We are thrilled that the middle school students received the opportunity to showcase their hard work so far this school year and perhaps more importantly, engage with and give back to our local community, as that is part of the Independence spirit!